Quality assurance | About Us | SK-Electronics Co., LTD. In the SK-Electronics group, each business division and group company develops a “Quality Manual” to establish a quality management system based on the quality assurance provisions of the entire group. We conduct quality audits to check quality assurance activities. 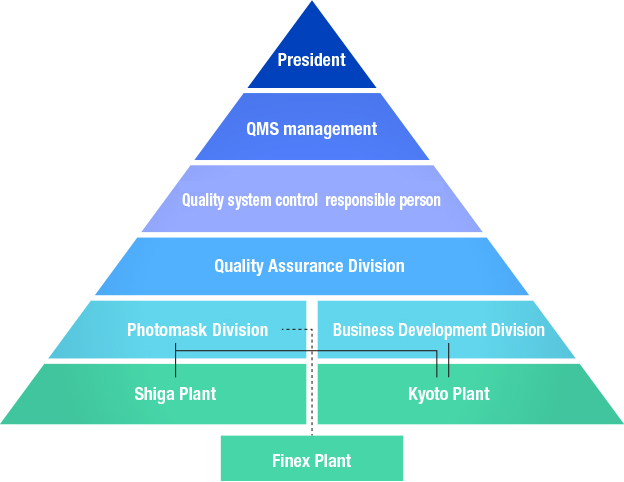 Two plants (Kyoto Plant, Shiga Plant) in Japan and overseas group plants (Finex Plant: Tainan in Taiwan) acquired certifications of International standard ISO9001 for its quality management system. Each organization thoroughly carries out PDCA cycles of “development of improvement plan,” “execution of improvement” and “evaluation of achievement status” and strives to secure quality, continuously improve quality and prevents quality problems before they occur, and further, continuously conducts effectiveness audits of the quality management system. Internal quality auditor conducts system audits once a year. Certification authority renews and conducts reviews to maintain once a year. Quality audit is conducted for each vendor who establishes quality assurance activities. The “Quality Assurance Division” of this functional division sets up a system to globally promote improvements in quality. For example, the division operates a system to evaluate and certify the process quality for each vendor for purchased components in cooperation with the Materials Division of each business division for the purpose of ensuring global quality. We control inquiry information and defect information from customers and strive to detect serious quality problems related to customer quality early and prevent the same quality problems before they occur. The quality meeting discusses and decides important items involved in exchange of information related to quality and implementation of countermeasures. In addition, this meeting is a place to strive to improve the quality control system and transmit information from the overseas plant to the domestic plants. The System Improvement Committee discusses and decides important items involved in exchange of information and implementation of countermeasures in order to coordinate awareness and recognition between divisions when establishing, revising and disposing of standards documents related to QMS across divisions.